This is a very simple shorts pattern. 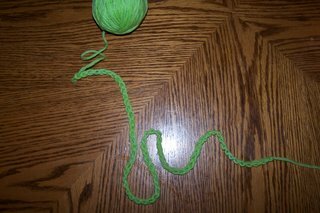 Although, it will take more yarn than other soaker patterns. It will fit size NB all the way up to 4T. 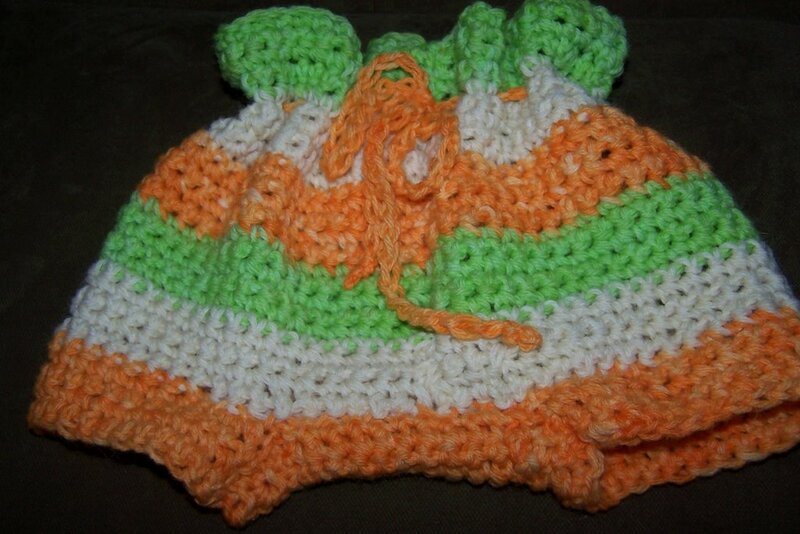 This one is made with all single crochet (SC) so you can do this even if it is your first crochet project. 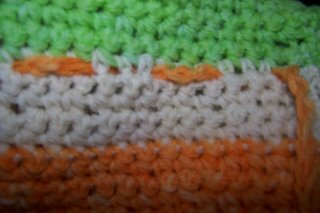 Single crochet should work well for a night cover even on a heavy wetter. People who knit or crochet a lot might be disappointed with this pattern as it isn't quite as nice as many of the beautiful soakers I have seen pictures of. Green, off white, and orange were used because of their neutrality. They are good colors for a boy or girl. 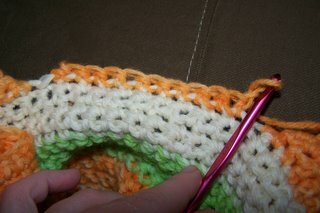 Using wool yarn and crochet hook (I). 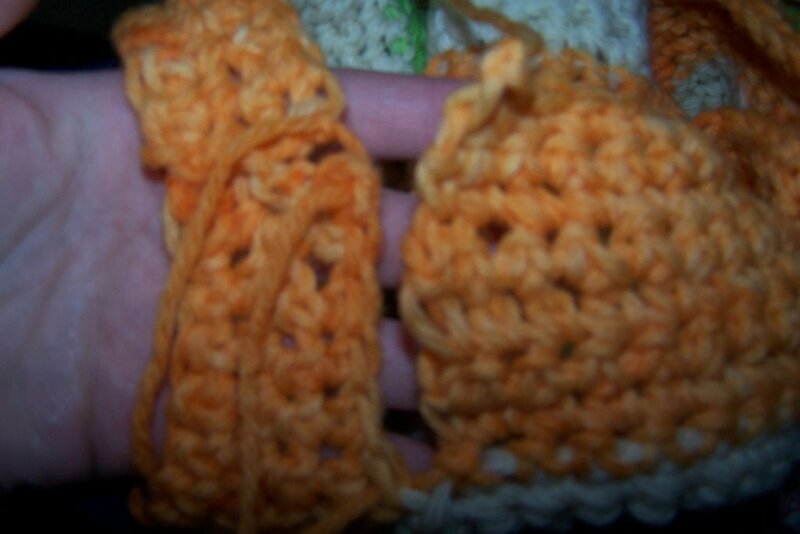 Single crochet 4 more rows (giving you a total of 5 rows). 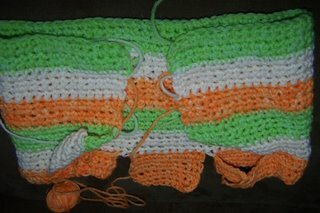 Change color to off white and single crochet 5 rows. 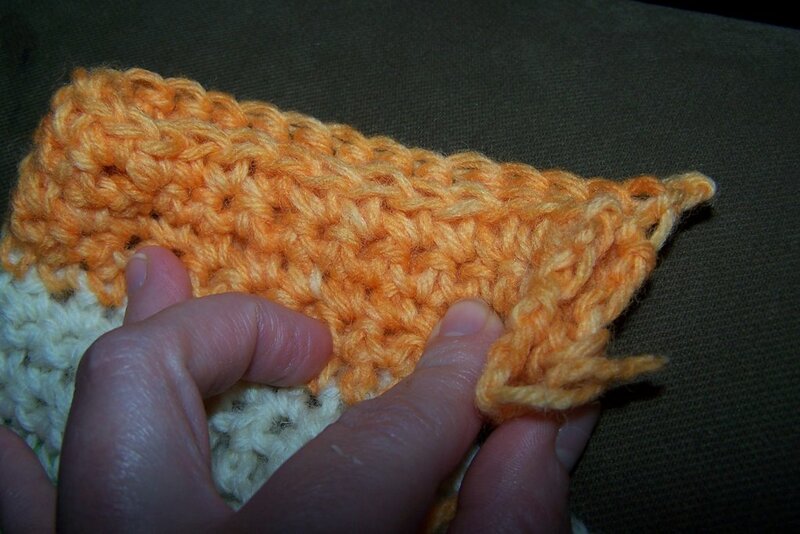 Change color to orange single crochet 5 rows. 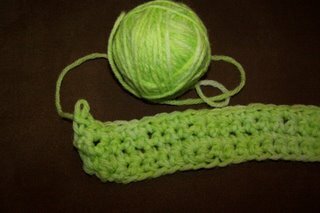 Change color to green and single crochet 5 rows. 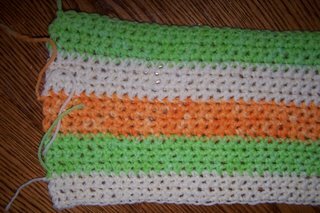 Change color to white and single crochet 5 rows. With orange yarn chain 5. 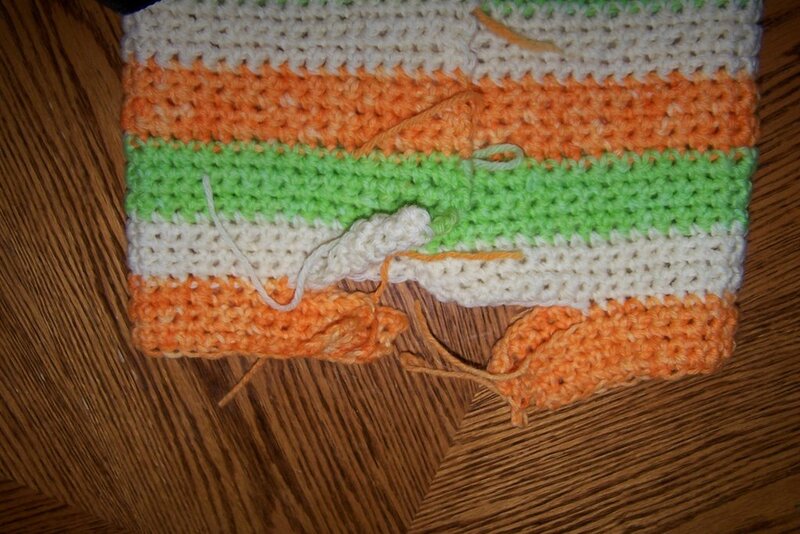 Count in 10 stitches from edge of off white and single crochet 20 stitches. Chain 5 more stitches. 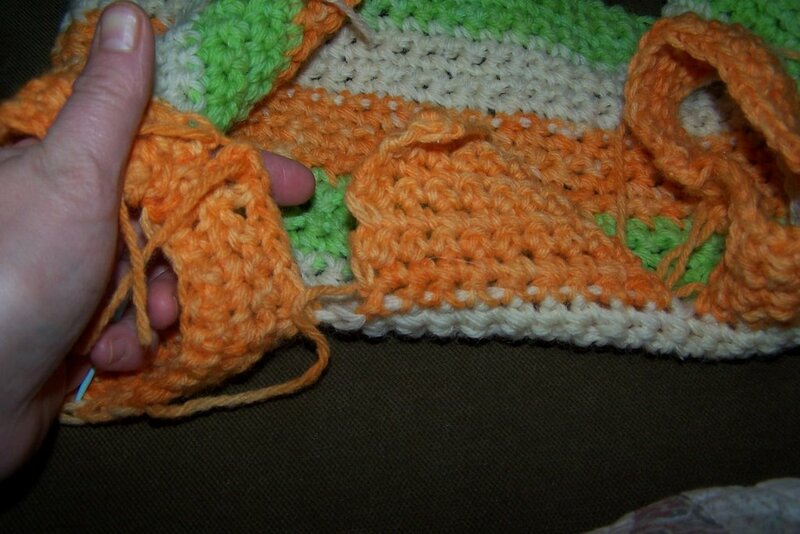 Make 4 more rows of orange. Tie off yarn. With orange yarn chain 5. 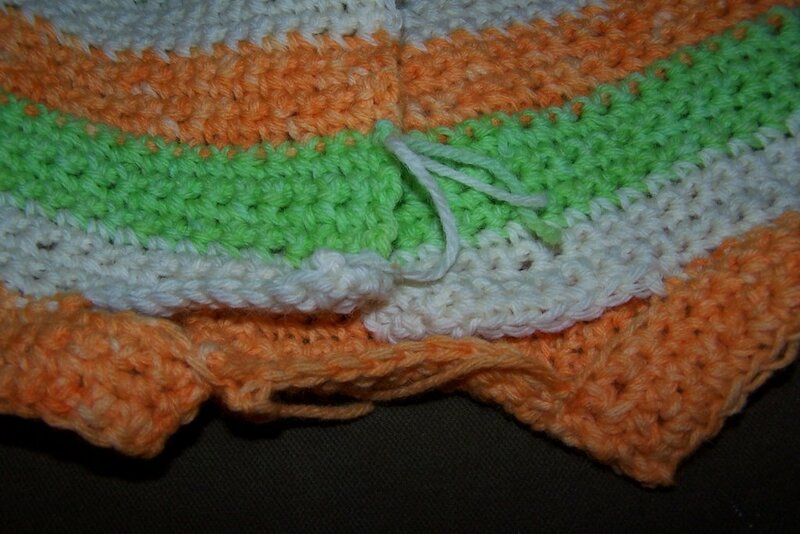 Count in 10 stitches (same as other side) from edge of off white and single crochet 20 stitches. Chain 5 more. Fold the sides to the center. It will begin to look like shorts now. Sew up orange to form leg holes. 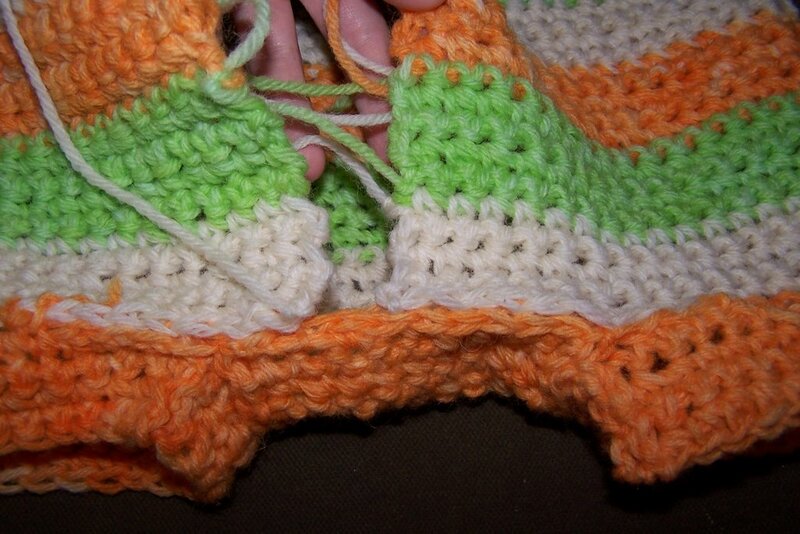 With orange once again start 30 stitches in and single crochet the off white stitches in the center. 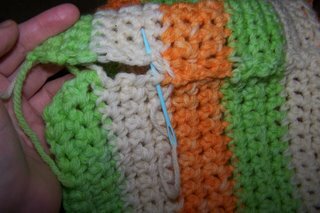 This time stitch 10 rows. It should now look like this. Sew up crotch from back of leg hole to front on both sides. 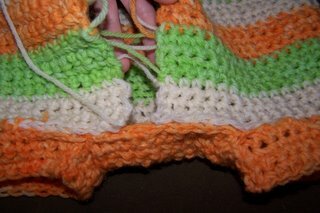 Line up front and sew off white to orange. 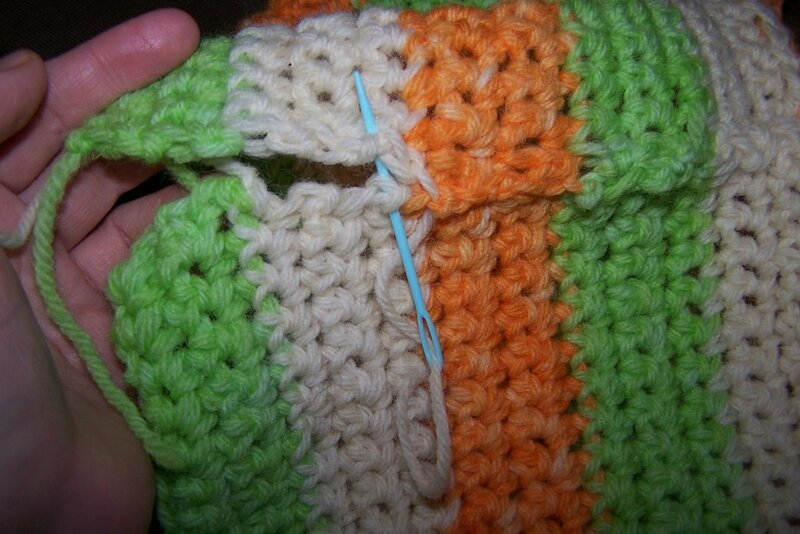 Using the yarn ends sew together in the center. Take a long chain in your color choice and weave in and out to form drawstring. I hope this is easy to understand. You can email me if you have any questions. I will post pictures tomorrow to show how it works as a one size fits all. I live on a tiny farm. I love my husband, children, animals, sewing, knitting, crochet, spinning wool, weaving, quilting, photography, and everything else crafty. One last post on wool shorts. Sneaking in time to make soaker shorts.